In the framework of the EUMedRail project and Annual Conference, that will be held on 9/10 October 2018 in Brussels, Multitel will set-up a technical visit dedicated to official Delegations from the Southern Mediterranean Region. In the scope of the EuroMed initiative, the European Union Agency for Railways agreed with the European Commission to set-up a series of activities in the field of railway safety and interoperability to support Algeria, Egypt, Israel, Jordan, Lebanon, Morocco, Palestine and Tunisia – in their development of modern, safe and reliable railway systems. 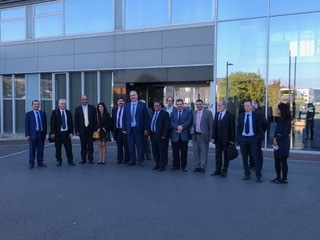 Multitel is glad to welcome these official delegations (Ministry of Transport and Rail Operators/Agencies) to finalise the programme with a technical visit in its premises, including an exchange of views on main ERTMS challenges and opportunities.